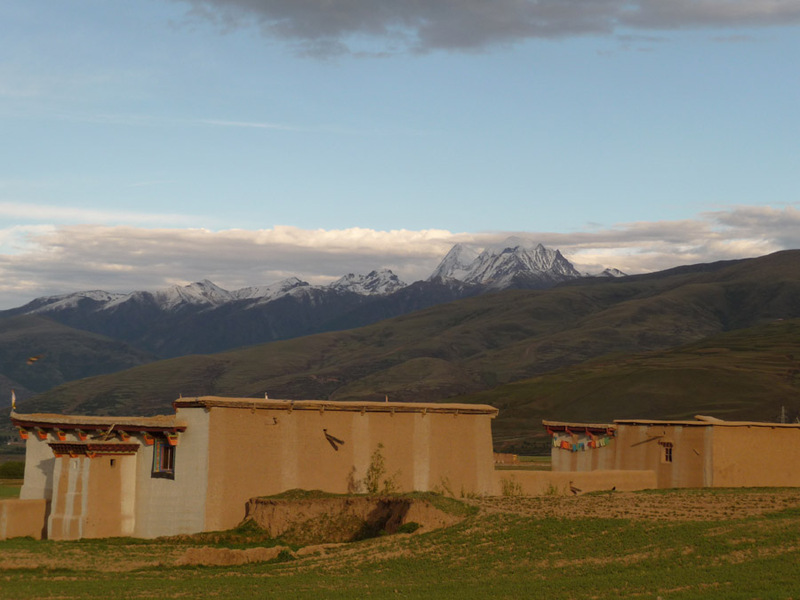 In Oh Szang Village, we spend a lot of time staring at Khowalangri Mountain which rises up, miles away at the end of the valley. It is considered to be the spiritual home of Chagdud Tulku Rinpoche, a famous Tibetan Buddhist teacher, who was a spiritual mentor to many of my friends in the United States. 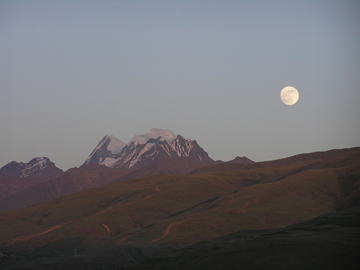 The mountain glows in the early morning, sparkles during the day, and shifts to rose pink in the setting sun. 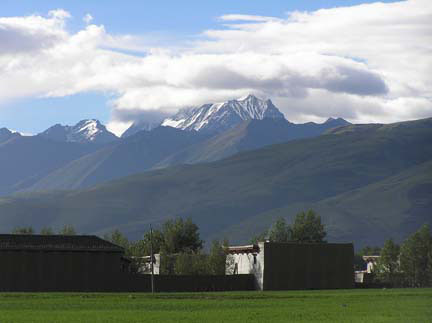 We can’t take enough photos of it—it’s spectacular, and the Tibetans can’t get enough of looking at the photos we take. We get up early, but Lhamo Choedon is always up even earlier: cleaning, making big round pieces of bread, churning the butter, carrying up yak dung for the fire, hauling water from the well. We wander around while the yaks head up to the mountains, Uncle Tsering Ngodhup burns the sage in the morning blessing ceremony (smoke is coming from the burners on the terrace of every home in the village), kids are scrubbed and fed and sent out the door to school. It’s 7:30am and I am called out to see Sonam, the neighbor across the road, a relative of Uncle Tsering Ngodhup, and the mother of a 21 year old boy who was arrested during a demonstration in Gansi last year. Before the Beijing Olympics there were demonstrations all over Tibet—thousands of people marched and held up signs, calling for a Free Tibet and for UN attention to human rights abuses on the Tibetan Plateau. Sonam’s son had held up a sign that said Let the Dalai Lama Return to Tibet. He was given a sentence of 2 years and 6 months in the prison in Chengdu, 18 hours from here, so it makes it almost impossible for his family to see him. While in prison, his hand was beaten with an iron truncheon until the wrist and fingers broke. He had been a promising thangka painter (Tibetan spiritual painting), and now, still in prison, is struggling to regain use of his hand. His mother believes his hopes of painting are over. Sonam came to bring sho, the infamous yogurt the whole village now knows we are pining for, and to thank me for helping the political prisoners who were arrested during demonstrations before the Olympics. I had sent money to Rinchen’s family who distributed it (keeping copious notes it appears) to the poorest families, the money allowing them to provide food and medical care to sons and daughters who had been arrested. Generally, political prisoners are given a half cup of rice a day and a small cup of hot water, so without food provided by the family, they may easily starve to death. By 9:30am, Sonam has gone and we are on the road with Uncle Soega, off to do the final scouting on the site for the camp we will set up beyond Oh Szang Village. We find the perfect spot across a river (a place Uncle Soega reminds me where I took a long nap a few years ago while painting flowers–Tibet is a great place to take naps), with the Chola Shan Mountains rising at the end of the valley, a nunnery reduced to ruins during the Cultural Revolution, and a large area the length of a football field filled with stones carved with Om Mani Padme Hum (the Tibetan national prayer for compassion and to end suffering for all sentient beings). 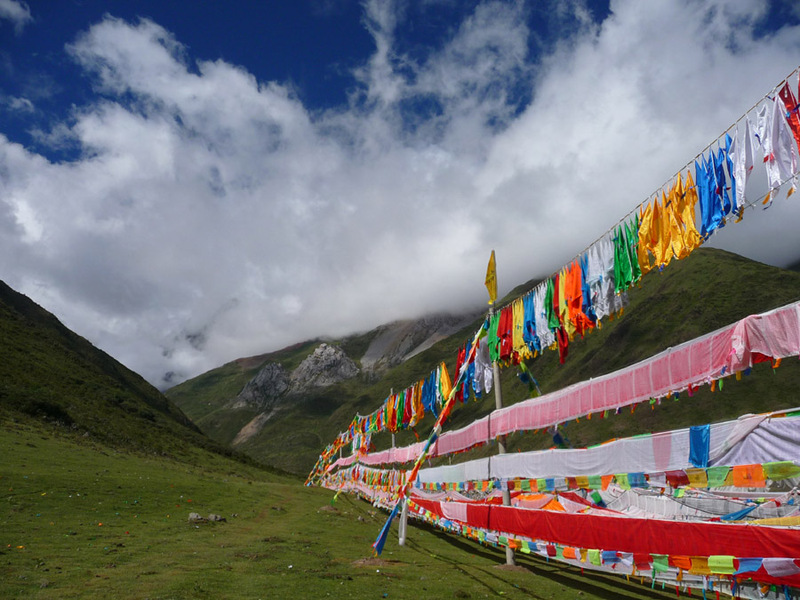 Along the edges of the mani stones are tall poles strung with thousands of prayer flags, all blowing in the wind. A yak herd wanders by, two nomads walk up to their horses in the field and sit down for a picnic. The question is—how will we get the 19 passenger bus into the area? There is a steep, dirt road that winds around the mountain. Uncle Soega and the taxi driver think the bus will make that descent and ascent quite easily. Barb and I assure them this won’t be the case. We talk back and forth and Uncle shows me, using pantomime, how the bus can ford the river. I can’t see it, frankly. He keeps telling me the bus will either ford the river or wait on the other side and a smaller car will shuttle guests and camping equipment back and forth. I still see only a rushing river below us. He draws me a map to show me how this act will go, and we walk down to the river, while the taxi driver goes to get the car up on the road and drive down to show us how simple this will be. Indeed, he drives across the river, submerged above the wheels, but makes it through. Okay, you win. It can happen. We can bring in 15 guests plus all their gear, the tents, the food, the stoves, the chairs, and the art supplies–piece of cake. We all pile in the car to go back across the river, and within a few seconds the car is swamped, water pours in under the doorframes, and the engine stalls out. We get out to look more closely at the situation, whereupon the taxi driver immediately takes out a rag and starts washing off his car, rubbing at various spots that need cleaning. Crossing the River at Camp Site #1-No Problem! During a lull in the cleaning activity, we push- Chik, nye, sum. Chik, nye, sum and we push. Little by little the car moves toward the opposite shore. At one point we are stopped by large rocks and the driver takes the opportunity again to do a little more washing—taking out the dirty floor mats and giving them a quick scrubbing in the river. We push the car to the other side, turn it to face the sun, open the hood and wander around until the engine dries out a bit. 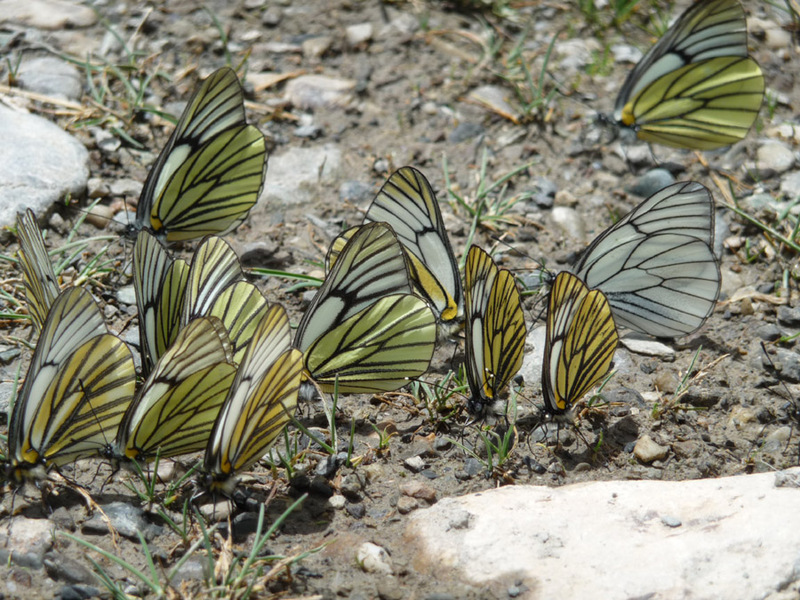 Uncle Soega, always curious, finds a whole kamboodle of butterflies resting on the ground and calls me over to take a photo. 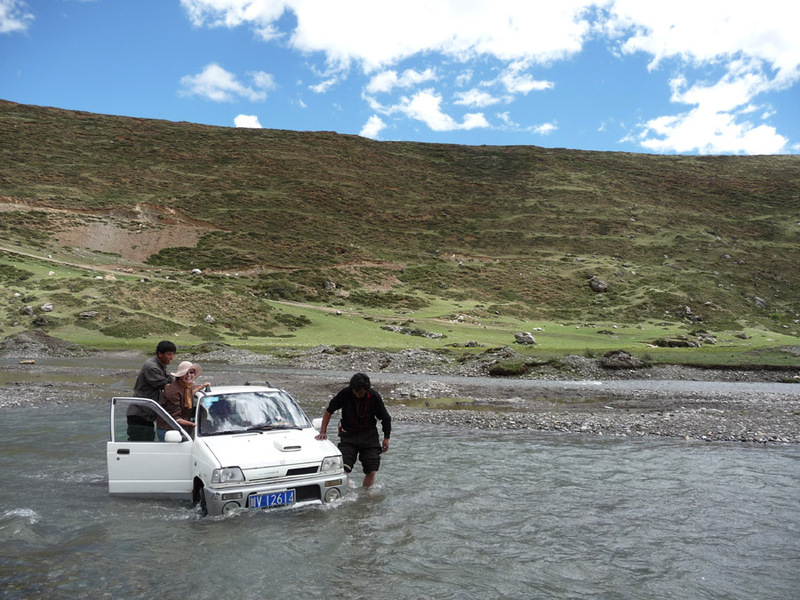 Fifteen minutes later, against all odds, the engine starts up and we drive back to Oh Szang, talking about how the river will be lower in July and August and the crossing will be easier. 2:00pm and we are at the home in Oh Szang Village when there are loud voices at the front gate—Gya-Mi! is the word. The Chinese police are here! Barb and I grab our passports, while Lhamo Choedon scrambles to hide my computer, filled with evidence of time in Dharamsala and my friendship with Rinchen. Nine people troop up the wooden steps. Khandro shrinks to half her size right before our eyes, and leans back against a wooden post. Uncle Soega comes in behind the police. He has met them at the front gate. One of the police speaks some English and is very excited to talk to us and practice. Only four of the people in the group are police, the others are his friends who have come to see the foreigners. What we are doing here? We’re flower painters—here to see the wildflowers. I take out the prints of the flowers I painted in past years and they pass them around and ooh and aah. Why are we in this village? The people are very kind to us. Uncle Soega tells them that I am paying the family to stay here—it helps them because they can’t work. How long will we stay? Probably a few days, we aren’t sure, there aren’t so many flowers right now. Have I ever been to India? I avoid the probability that he is talking about Northern India, the seat of the Tibetan Exile Government and say instead: Oh yes! I was in South India, the flowers are beautiful there. Have I been to China before? Yes, twenty years ago and a few other times. Why? Do you like it here? Oh yes!! The people are very kind. 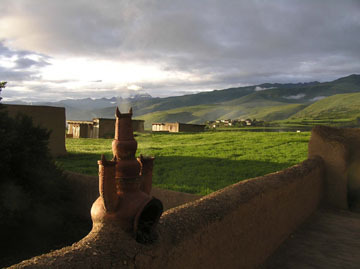 Have you been to Gansi Monastery? 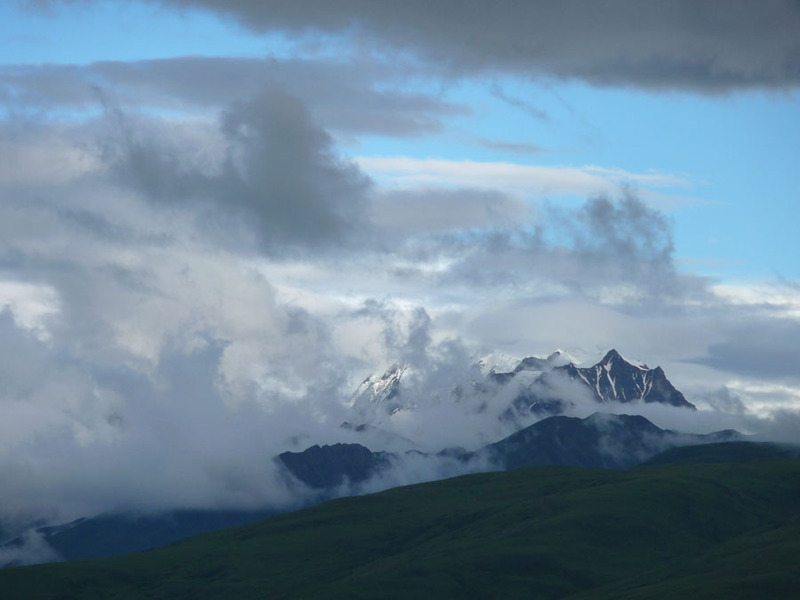 (Gansi Monastery is the hotbed of demonstrations and dissent–many of my friends in India were monks at Gansi Monastery before they were sent to prison and tortured for demonstrating). I went before, I tell him, but not this time—I’m too busy to go right now. Maybe later. It looks interesting, but we’re searching for flowers. A very tall woman, a cross between an evil spy out of a James Bond movie and Nurse Ratchett, is one of the police. She is dressed in a Tibetan chuba, but as Khandro says later She looks Tibetan, but speaks like a Chinese. I am smiling so much while talking to the police that later my Pollyanna face has to be massaged back to life. They copy down the information from our passports, tell us to be careful so we will be safe in China, and if we have any problems at all, to come and see them at their office. Just before they leave the English-speaking policeman says to me, One last thing. I advise you to guard your secret carefully. Be careful with your secret. What secret? I think he is using the wrong word, so I spell it out. S-e-c-r-e-t? That’s right. Secret-be sure to keep your secret. And with that mysterious message that only he and Barb and I could understand, they were gone and we were drinking hot water, eating biscuits, gazing at Khowalangri Mountain and talking about how the afternoon went down.